Which material is the best for your custom door? The great debate of Iron VS Steel is a familiar debate when customers think of style and safety. However, which material is best for you and your home? Here’s some information about both materials that should help to make this decision a little easier. Durability: Our steel doors are durable and sturdy thanks to the 18-gauge dent resistant and kick-proof steel. Since the steel door has a polystyrene or polyurethane core that’s covered in steel, it is less likely to warp or rot. As a result, the life expectancy of the door is increased. Manufacturers are so confident in this material, they tend to provide extended warranties to cover the durability and stability of the door. Energy Efficiency: The patented thermal-break design of this door blocks the scorching heat and the brutal cold from entering your home. As a result, your energy bill should decrease. Appearance: A steel door can highlight a beautiful home. The structure adds a curb appeal that will have your home labeled the most beautiful home on the block. Durability: Our doors are made with 14-gauge iron, 5/8 inch grill, and heavy-duty barrel hinges, prehung, e-coated, and powder coated. In addition to their sturdiness, iron doors are also fire resistant. As a result, iron doors are commonly used in government buildings and castles. Appearance: This material is very artistic and unique. It creates a look similar to a castle door which sends a signal royalty is occupying your home. Security: It is a well-known fact that iron doors are extremely difficult to breach. Burglars recognize the high level of difficulty needed to break into a sturdy wrought iron door. Its remarkable stability sends the message to outsiders that this particular family is NOT an easy target and they take their safety seriously. As a result, criminals’ deterrence stops them from unwelcomely entering your home. Additionally, we stain our wood doors the traditional way: with an oil-based finish. For our local customers, we offer installation and our Crate & Freight Program. This program provides curbside delivery to the location of your choice. All in all, we are your one stop shop for your custom door needs. 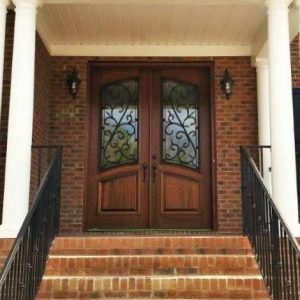 Whether you decide to get an iron door or a steel door, we have a variety of doors made both materials. Additionally, our company’s twenty-eight years of experience collectively can assist you in deciding the right type of door for your home and your budget. For more information about our company and our inventory, contact us at 281.890.5860 or visit our website here. We want to provide you with the best custom door for your home.